We’re over 8 years into the current economic expansion, which makes this the third longest expansion in United States history. In fact, if we go another 2 years without a recession, we’ll have the new American record without one. That sounds like good news to some people, but stock market valuations are also at historically high levels, which should make value investors nervous. Being this far into a market cycle with high valuations is not a particularly easy environment for a fundamental investor to operate in. The cyclically-adjusted price-to-earnings (CAPE) ratio, developed by and often named after Robert Shiller, measures the current average price of the S&P 500 divided by the average of the last ten years of inflation-adjusted earnings. 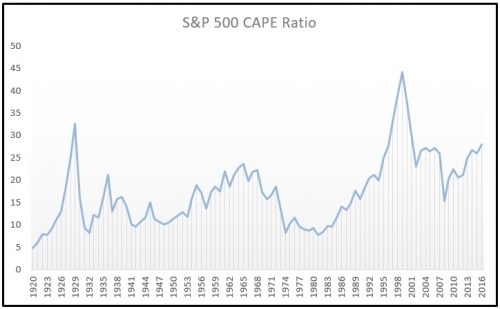 Shiller, a Nobel laureate and professor of economics at Yale, has shown with 130 years of backtesting that whenever the CAPE is this high, long-term returns aren’t good. It doesn’t tell us anything about short-term returns, but it’s highly predictive of long-term returns. When markets are expensively priced, there’s more room to fall in the event of a recession. We might or might not encounter a recession any time soon, but at this stage in the market cycle, investors should be prepared for one. Even if global growth slows, it’s a badly needed area of investment and rejuvenation due to “years of chronic underinvestment” as the report describes. 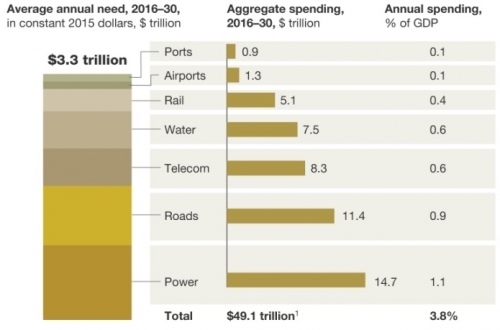 And this doesn’t even include most energy infrastructure. Moreover, infrastructure consists of very long-term assets that usually have stable cash flows. This makes them great dividend/distribution yield opportunities. Even if we encounter a recession or flat markets for a while, investments yielding 4-6% or more can continue to be highly lucrative. The partnership has grown its funds from operations (FFO) per unit by a compounded 19% per year over the last 8 years. They’ve grown distributions per unit by 12% per year on average over the same period, which when combined with a 4-6% yield during that entire period, has resulted in market-beating returns. Unlike most MLPs that pay out 90% of their cash flow as distributions, Brookfield pays only 60-70% of their cash as distributions and uses the rest for growth. This results in a lower yield, but makes that yield very safe and allows their distributions to grow more quickly than many MLPs can grow their distributions. The partnership currently offers a distribution yield of 4.3% and owns 33 different businesses. For investors interested in global exposure to infrastructure, this is a pure-play business, and a solid place to invest money. 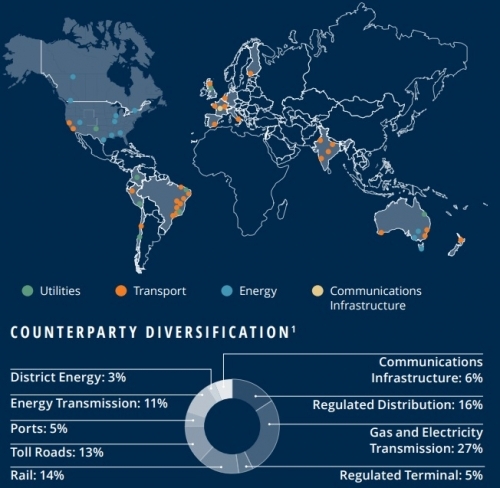 Examples of their assets include natural gas pipelines and toll roads in South America, telecomm towers in India, and freight rail and metallurgical coal ports in Australia. Overall, with just 1-2% core GDP growth assumptions, Brookfield can provide solid returns even with limited economic growth. Magellan Midstream Partners operates a series of crude oil and refined products pipelines throughout the United States. 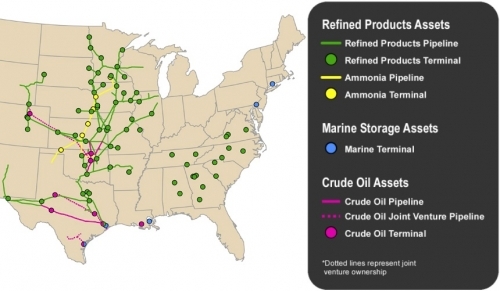 They also own 5 marine storage facilities along the east and gulf coasts. The partnership currently yields just over 5% and has a history of 12% annual distribution growth since 2001. Based on a dividend discount model estimate, even if the partnership only grows distributions by 7% per year over the next decade and 4% per year thereafter, they are slightly undervalued at the current price of around $70/unit. When energy prices crashed in 2014 and 2015, Magellan remained solvent because more than 85% of their business lacks exposure to commodity price changes. Most of their commodity risk comes from butane blending, which derives its profit based on the price spread between gasoline and butane. 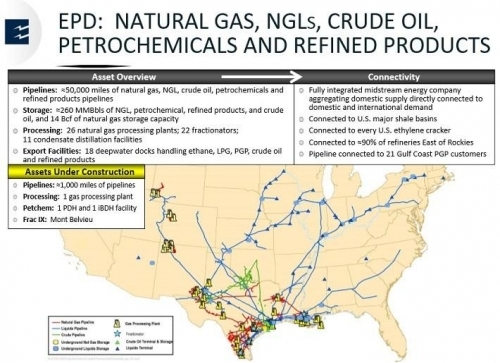 The bulk of their revenue is tied to volume– moving and storing crude oil and refined products. Most MLPs have what are called “Incentive Distribution Rights” or IDRs for short. These are payments they have to make to their general partner as they become more profitable over time. Magellan, however, eliminated their IDRs years ago, which simplifies the business structure and allows 100% of the cash flow to go towards unitholders and reinvestment in the partnership. With stable BBB+/Baa1 ratings, Magellan has some of the highest credit ratings in the industry. They completely cover their distribution with operating cash flow at the current time, and they have nearly $1 billion in planned investments for growth through 2017 and 2018. The highest yielder on this list is Enterprise Products Partners, which currently gives investors a 6% distribution yield that is fully covered by operating net cash flow. Enterprise Products Partners’ market capitalization is nearly 4x as large as Magellan, which makes them one of the largest midstream businesses in the nation. What makes Enterprise Products Partners particularly compelling is their 18 deepwater export docks. China and India import nearly half of their LNG, because LNG is a highly portable fuel source for cooking and heating in areas that don’t have natural gas infrastructure. China also has a strong demand for LNG for their petrochemical industry. This partnership is a bit more leveraged than Magellan, and has had a little bit more commodity exposure. While the S&P 500 has rallied to new heights, Enterprise Products Partners is 30% below their peak unit price, and trading at roughly the same prices it was back in 2012. But their distribution remains safe, they have eliminated their IDRs like Magellan has, and their credit rating is much stronger than most other MLPs. Analysts have a “strong buy” consensus right now, according to Nasdaq. None of these three partnerships are deep-value plays with a lot of immediate upside potential like some of the more leveraged MLPs right now. But investors broadly consider these three among the best-managed players in their respective industries. They have the least leverage, the safest distributions, and most likely plenty of growth ahead of them. Disclosure: The author does not own any partnerships mentioned in the article and has no plans to acquire any units in the next 72 hours. She owns shares of Brookfield Asset Management, which owns the controlling stake in Brookfield Infrastructure Partners. Lyn is an engineer and investor with a graduate degree in engineering management, and much of her career has been in technical procurement, project management, and budget planning. She has over a decade of investment experience with a focus on income-producing assets, and writes in-depth articles about finance at LynAlden.com.